Wave energy, in contrast to solar and wind energy, has been relatively costly and difficult to tap into. However, engineers at Sandia National Laboratories have been endeavoring to change this by looking to other industries. 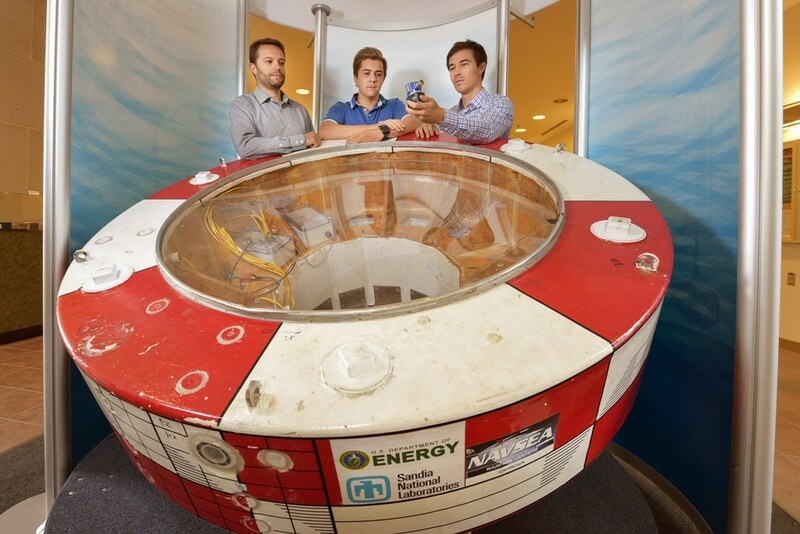 Sandia National Laboratories water power engineers Giorgio Bacelli, left, Dave Patterson, center, and Ryan Coe with Sandia’s wave energy converter buoy. CREDIT: Randy Montoya. Sandia’s engineers have designed, patterned, and investigated a control system that increases the quantity of power absorbed by a wave energy converter from oceanic waves, thereby rendering the electricity generated from wave energy less costly. The engineers adopted classical control theory and robotics and aerospace engineering design concepts to enhance the efficiency of the converter. As part of a multiyear project supported by the Department of Energy’s Water Power Technologies Office, engineers of Sandia’s Water Power program have adopted a combination of modeling and experimental investigation to improve the way a wave energy converter goes about and responds in the ocean to tap wave energy as well as working on how to improve the device’s resiliency in an adverse oceanic environment. We are working to create methodologies and technologies that private companies can harness to create wave energy devices that will enable them to sell power to the U.S. grid at a competitive price, by getting more energy out of the same device, we can reduce the cost of energy from that device. The wave energy converter designed at Sandia is a 1-ton, large ocean buoy including sensors, motors, and an onboard computer constructed at a reduced size apt for an testing setting. In general, commercially available wave energy converters are large and may be part of a group of devices, such as a wind farm including a number of turbines. In order to gain energy from the oceanic waves, a wave energy converter moves and bounces in the water, thereby absorbing power from waves when they produce forces on the buoy. Sandia’s earlier investigations concentrated on analyzing and modeling the way devices move in an ocean-like environment to develop a numerical model of their device. Using the model they developed and validated last fall, the team wrote and applied multiple control algorithms to see if the converter could capture more energy. A control algorithm is a set of rules you write that prompts an action or multiple actions based on incoming measurements, the sensors on the device measure position, velocity and pressure on the hull of buoy and then generate a force or torque in the motor. This action modifies the dynamic response of the buoy so that it resonates at the frequency of the incoming waves, which maximizes the amount of power that can be absorbed. Giorgio Bacelli, an engineer at Sandia. The control system utilizes a feedback loop to respond to the operations of the device by taking measurements 1000 times in 1 second to constantly fine-tune the movement of the buoy in response to the types of waves. The researchers created a number of control algorithms that the buoy could follow and then they investigated the control system that would give the perfect outcomes. According to Bacelli, although the main aim of the control algorithm is to increase the transfer of energy between the buoy and the wave, the amount of stress transferred to the device must also be taken into account. Outcomes of numerical modeling using the control algorithms demonstrated its great potential and using these results in August, the researchers took the converter to the U.S. Navy’s Maneuvering and Sea Keeping facility at the Carderock Division in Bethesda, Maryland, to investigate the innovative control techniques in an ocean-like environment. The length of the wave tank facility is 360 feet and its width is 240 feet, and it includes a wave maker that is capable of producing accurately measured waves to imitate different ocean environments for many hours at a stretch. Sandia researchers adopted the wave tank to imitate a full-size ocean environment off Oregon’s coast but reduced its size to 1/20th of the size of normal ocean waves to complement their device. The researchers carried out a baseline investigation to evaluate the performance of the converter with a simple control system to direct its actions and movements. Subsequently, they conducted a sequence of investigations to analyze the way different control algorithms designed by them impacted the potential of the device to absorb energy. This year, the device can move forward, backward, up and down, and roll in order to resonate at the frequency of the incoming waves, all degrees of freedom were actuated, meaning there are motors in the device for each direction it can move. During testing we were able to absorb energy in each of these modes, and we were able to simulate the operating conditions of a device at sea much more accurately. Actually, the investigations demonstrated that theory was in close correlation with the actuality in the wave tank. The control algorithms were able to more than double the amount of energy the wave energy converters were able to absorb without a control system. The researchers are examining the data from the investigativation and are looking for more ways to fine-tune the control systems to increase energy transfer. Click to view a video from The Department of Energy’s Office of Energy Efficiency and Renewable Energy about Sandia National Laboratories’ wave energy converter testing at the Navy’s Maneuvering and Seakeeping Basin in Bethesda, Maryland.